It's Saturday morning around nine-o-clock. I'm at Champion Food in Fountain Valley, sitting in a plastic chair, resting my elbows on a fold-out table, waiting for my order to be prepared. In the corner, with a commanding view of the room, next to a rickety shelf of imported foodstuffs, two old Chinese men sat, their faces hidden behind newspapers, visible only when they took a sip of hot soy milk from a styrofoam cup and a bite from a crispy, deep fried cruller called youtiao. Meanwhile, the owner -- a middle-aged man with kind, sleepy eyes -- shuffled out from the kitchen, carrying a serving tray of freshly-made Chinese onion pancakes to a group of women at another table. Throughout the morning, customers would trickle in, though most would just grab a Chinese newspaper from a stack next to the door, walk up to the counter to plop a few coins down, then leave without saying a word. This is the typical weekend scene for the place. During the weekday, it's just a deserted boba shop and Chinese jerky store -- a walk-in, walk-out joint where you could buy a Ziplock bag of frozen dumplings but no food is served. Come the weekend, Champion tranforms into one of the few places in Orange County to take in a traditional, starch-laden Chinese breakfast and wash it all down with soy milk -- but only from 8:30 AM to 2 PM. When my to-go order was ready, the owner handed me the stash with a polite bow. I thanked him and took the pile, which was crammed in a dusty, old cardboard box. After I got home, I poured the still steaming soy milk ($1.25) into a cup for easier sipping, and cut the foot-long, flaky, golden crullers they called "Twist Dough" ($1.50) into segments. The soy milk, although a bit chalky, was just the thing to cleanse the palate after the oily crunch of those Chinese "donuts". Just like their American counterpart, dunking is not just acceptable, but required. Since it was freshly made, the onion pancake with egg ($3.50) was still warm and crisp even after the transport time. The flat discs of dough -- which is essentially nothing but flour, salt, fat, and scallions rolled thin and layered over each other -- was pan-fried with an egg, cracked right over the top. The result was like the Chinese version of French toast, except no vanilla or milk is involved; just the carbs and the protein. While I'm making comparisons, I'll also say that the sesame pie with beef ($3.00) was like a shredded beef taco -- but only because you eat it like one. The flavors, though, were much simpler. The gossamer-thin crust was crisp and pliant (yes, like a tortilla); the shreds of beef were savory, but not overwhelming -- hit with just enough cilantro and green onions to refresh. The BBQ pork buns ($1.25), on the other hand, could've used something to lift it out of its doldrums. The bread was too dense and the pork was not saucy enough. Next time, I'll skip them for the best thing Champion does: the rice rolls. What is it? Well, it's just glutinous rice rolled around some sort of mystery filling -- a contrast of textures that simultaneously smacks and hugs the palate. First, you bite into the gummy and gluey chew of the rice. Then you encounter the crunchy, savory bits at the center, which feels like a bar brawl between Snap, Crackle and Pop in your mouth. If I had to guess, the crunch component must be the hacked-up chunks from one of those deep fried crullers I spoke about earlier. But there's more to it than that, especially in their "salty" version ($2.75), in which I tasted pork. And there's a "sweet" roll ($2.50) that's got crushed peanuts and something tooth-decayingly sugary. You wouldn't think these dull, cylindrical objects bundled in plastic could elicit a Pavlovian response. But now, knowing the treat that lies beneath the Saran Wrap -- it does. Because I didn't expect to love the suckers as much I did, I only ordered one of each. And since I was sharing the food with friends, I had to cut it up into sushi-sized pieces. Otherwise, both would've been all mine. But now I know better. Forget "The Breakfast of Champions". Instead, give me the rice rolls: The true breakfast...from Champion. *Special Thanks to Dumplings and Deb for this tip. I love those kinds of places! I'll take a chinese breakfast like that over pancakes at Bob Evans any day. BBQ pork buns are either really great or really bland, I find. 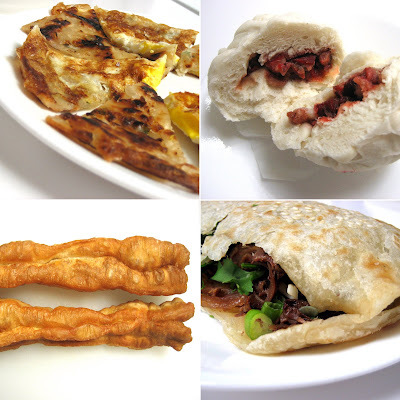 And even though the fried bread (you tiao, I believe it's called) is terrible for you, it sure it yummy. I like it cut up into congee. Wow, I miss that place. 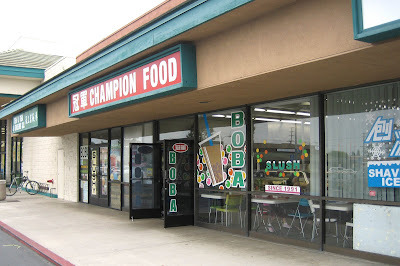 I've never had any of their food (maybe crispy chicken at one point), but I used to go there all the time for boba! How does the Irvine location compare to the FV one? Champions is just about the only place I can find that can provide a nostalgic bite of Taiwan breakfast. I'd have to agree with you on those rice rolls. They're just about my favorite item they serve. The other filling components of that deliciously starchy morsel is shredded dried pork, finely chopped peanuts (sometimes), and I THINK pickled mustard plant. I can't believe you actually took my recommendation! Haha, I bet you probably have an itinerary for the restaurants to explore. I'm glad you enjoyed the "fang tuan"! One or two rolls of that, with a cup of sweet or salty soy milk are all I need to fulfill my Taiwanese breakfast nostalgia. As for Christine's question, I know most of the boba was made in FV and then transported to Irvine. I am not sure about that now, but the boba at both places taste about the same. The owner of FV is actually thinking of selling the business. His first Champion was established in Anaheim, and moved to FV in 1994. You know, Elmo, of all the restaurants I found through your blog, I have been visiting Waikiki Hawaiian Grill religiously. I don't know why, but that lady owner's husband can cook some mean fried rice and BBQ ribs. I went to Costco yesterday and picked up some McCormick & Schmick's certificates after reading your review. It's basically a $80 package, which includes two $50 certificates, a colored M&S cookbook, and a DVD. We'll see how that goes. Its funny, but I'm one of those customers who would come in only to buy a newspaper for my parents as we ate next door at little wei. At one point, little wie had to be considered one of the best chinese restaurants in OC/LA, and its really sad to see what happened to the place. Even though my family lives a lot closer to Champion, we would always pass by Champion to take the 405 to Irvine and go eat breakfast at the 99. 99 has a wider, more diverse selection and Champion was considered too expensive if you had a family to feed. And, on a personal level, we knew the person who was actually making all this stuff to sell to Champion and we refused to support the business practices of Champion's owner. And, if you think Champion's food is good, you should try the dumplings that the person, who sells all this stuff to Champion, makes. Only you can't find it at Champion, and need to drive out to Monterey Park to find them. Her dumplings were always considered her speciality, and best dish. Wait a minute, in regards to the dumplings, would you by any chance be talking about that little booth in the Hong Kong supermarket? I think it was the rowland heights branch. If thats the one you're talking about then heck yea! They have awesome dumplings there. Hand made the night before or sometimes the day off then flash frozen. I love the ones with the pickled napa and ground pork filling. Absolute favorite. ah you found the place. It's all carb that I don't need but I still eat them especially the glutton rice ball with the fry cruller with dry salty pork. I never tried the sweet version but will try next time. Love that mystery meat! When we have friends and family over, we always have that one dish with "mystery meat". It keeps everyone on their toes! Gosh, I've seen this place and never many a times and never go in. I can always count on you Elmo to get me into the doors of these places!! Off the subject here, but you should write about food visits to the food stands at the farmers markets throughout the OC. There's some really good stuff being served up there lately! We'd love to read your write ups on that! So.. this food is only available on the weekend? How cruel to be reading this on Monday morning, over my bowl of microwave oatmeal. I've never seen anything like those rice rolls before, but your description makes them seem so familiar. Do the serve congee or porridge here? Can someone recommend a good Chinese place that specializes in porridge and serves that fried bread? You and me both. I like the traditional American breakfast, pancakes and all, but it always leaves me lethargic and sleepy. To tell you the truth, I tried the Irvine one ages ago and that was just for boba. I'm not actually sure that the Irvine Champion does breakfast. Does it? Call it blasphemy, but I like the rice roll with a nice cup of tea. Perfect combo! If I lived close to Rowland Heights I would try it! Actually, I've eaten at the Hong Kong Market deli for breakfast. That place was also good...cheaper than Champion also! Yep, I think you're right. There was pickled mustard greens in there. The peanuts were exclusive to the sweet one though. I dunno why they don't just put it in the "salty" one too. Thanks again for the heads up. I had no idea about the place until you mentioned it! As for Waikiki, ain't it crazy what that dude does for fried rice. I've had fried rice in many places, but that there's one of the best! I usually go the 99 Ranch breakfast (read my post here). It's definitely cheaper. And I like that you don't have to wait...just pick up and go! These dumplings must be amazing. I've never tasted one...but I saw the prices they were charging for a frozen bag -- $13 to $15! I had to look up what Rousong was...and yup! It was exactly what I thought it was...dried pork. Known better as pork sung, I grew up eating it as abon (Indonesian word for the stuff) with rice and between two slices of buttered bread. The sweet version is just as addictive as the salty one. I can't say which one I preferred more, because from now on, I'll order both! Food stands at OC Farmers Markets? Where? I know the UCI Marketplace one has a few food vendors, but the others I know of is strictly just produce. And I've been meaning to check that out (if I can get up early enough on Saturday). But let me know of the others you know about. YES! LEMPER! That's exactly what it reminded me of. Of course, I had to keep that to myself because no one but us Indonesians know what lemper is. But unfortunately, yes...Champion only serves food on the weekends. I made the mistake of going there on a Thursday...they promptly shooed me away and told me to come back on the weekend. Well, they didn't shoo me away as much as they said "sorry, no food, just drinks". Although I'm not sure of it, there may be a Filipino equivalent to the rice rolls. Indonesians have something called "lemper", which Inez pointed out...and since the Philippines is between Indonesia and China (approximately), there must be something resembling it in Pinoy cuisine. I'm not sure if they served porridge. I don't think so though. Thank you for those kind words! You're right that some of it is a bit bland...but then that's just a good excuse to use plenty of that chili sauce they provide! I slathered most of it on those onion pancakes...yummy! Don't get the dumplings at Champion. To me, it is far too expensive for what you're paying, but then again, I feel that way about most of the food at Champion. The person I was talking about won't sell her dumplings to Champion, and you'll need to go to MP to find them. (sorry, david w. but that's not them) Although, if you want, I could see if I could hook you up and cut out the middleman. As for food vendors at Irvine's farmer's market, off the top of my head, I remember vendors that sell sausages, juice, cobbler, tamales, roasted corn, roasted peanuts, a couple of bakeries, italian pastries, salsa, and a vendor that sells middleastern/med food. I'm probably forgetting a couple. Personally, I feel some people get carried away by the whole aura of the farmer's market as if these vendors' products taste better because they're selling at a farmer's market. Some of these vendors are just okay and I haven't necessarily tried all those vendors, but I liked the sausage, the artichoke hummus, and the rum cake is divine... Its $3 for this little cake that fits in the palm of your hand, but in this case, I don't mind paying for it because I think it's that good. Josh - So are you going to share with the rest of us why the dumpling lady won't sell to Champion and what these business practices are? I actually have the phone number of this lady who makes the dumplings. david w, I buy my dumplings from that lady inside Hong Kong market every other weekend. She charges about the same as the lady in MP, but less the drive. The rice rolls looks alot like 'lemper'. I have to try that next time. I think we're talking about different people- the person I'm talking about sells her dumplings to a place in MP but lives in Orange County, near Irvine. If you can buy directly from her, I don't know why it would be that long of a drive unless you live closer to LA. Nice find and it's literally right down the street from me. It's exactly like lemper...except I've never seen lemper with abon in it...or maybe I have! I'm sure you'll like it. It can get a bit expensive, but in my opinion worth it...do get the rice rolls before anything else. Hah! I thought that looked like abon, but dismissed it as wishful thinking. I used to eat bowls and bowls of just abon + rice as a kid - this looks like a portable version of that. Yum! Speaking of eating bowls and bowls of rice w/abon...i think the ones they have here doesn't even come close to the one we grew up eating. I wish I can bring some from Indo, its just that i'm always so scared to bring food items back if it contains meat. Sounds good, we'll get a list together for you. We try to visit every market in the OC. We rotate our location visits every week, between LA & OC. Give us a few weeks and we'll have a complete list of the OC food vendors for you! If you're ever in LA, the Culver City(Tuesdays) and Downtown LA (Wenesdays) has some serious food vendors. Exactly right! 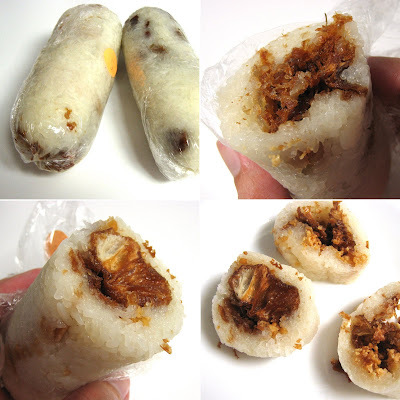 A lemper+abon hybrid that you can eat on the go! Yachtzee! Totally agree with you on that point. The 'pork sung' I've tried sold in tubs at 99 Ranch just doesn't have the 'oomph' of our abon...it's too light, too weak, and too fluffy. Indonesian abon is, by contrast, uneven with little knots and balled up pieces here and there, and bolder than kecap manis! No rush! Put it on your blog so that we can all enjoy! Then I'll scope out the ones near me. Thank you sooo much!!!! I had no idea places like this existed in Orange County. I've been looking everywhere and I thought I would have to head back to the SGV anytime I craved chinese breakfast like this. I once had rice rolls at this little vegetarian Chinese place in Industry Hills and was in heaven and there wasn't even meat in them. Besides Champion, which I can't wait to try because I forgot all about these wonderful rolls, do you know of any other places in Orange county that do Rice rolls? I'm in Orange and would love a place closer. Thanks. You're welcome so much! Please to enjoy! Hmm...good question. Champion has a branch in Irvine (but I haven't checked if they do breakfast)...the answer seems like no. But there is an A&J right next door that serves Chinese breakfast in the mornings. I have a feeling they might serve "Ci Fan Tuan"...when I find out, I'll let you know. I'm so glad that you finally got there to review it. We love the place. And I hope they never put peanuts in the salty version!!! I'm allergic. When I was a kid our live-in college student from Taiwan used to make me those and I was in heaven to find them. I know exactly what dish you are talking about. I believe it is called Yen Su Ji...and it's not a coincidence that it's normally found where boba is served!